WEEK 1 Day 1: Determined to complete it before moving on. Couch 2 5k: (C25k) I finally made it through Week 1 Day 1 without walking through half of the running prompts. 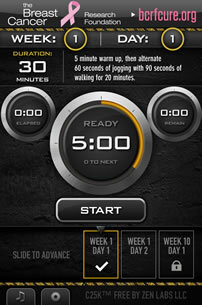 If you haven’t tried it, and are looking to get in shape to run long distances, I recommend it. For me, I don’t move forward until I can complete the Week and Day that I’m currently working. It’s a little embarrassing that it took me almost a month to get through the first day, even though I’ve already completed two 5k races…you can imagine how long it took. A new school year starts in just one week. Our students return in two. I’m ready to get things rolling. I’m sure it will pass as quickly as my summer seems to have passed. A new challenge begins when I have to figure out a way to write part-time while working full-time. I’ve been toying with this for 8 years, but I always seem to put the writing on the back burner until the next break in the school year. This morning, I found an old journal with many breaks in the posting. It’s like I stop thinking about queries as soon as I start writing lesson plans. This year will be different. I am determined to earn income from writing while I am teaching others to write. Stay tuned for updates. Oh, speaking of updates: I’ve started another blog: A Beach, A Book, and a Breeze where I am reviewing books and movies. I’ll be posting there about every other week; I read slowly. You never know what kind of books I’ll be reviewing, so sign up to be notified of new posts.